This knife feels very comfortable in the hand. I just don't know if this would be classified as a paring knife. It is marked as Stainless Steel Japan. 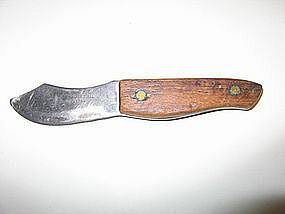 It measures a total length of 5 3/4 inches and an exposed blade of 2 3/4 inches. The blade extends the entire length of the handle. As you can see, I've used this knife a lot, over the years, and shows wear to the handle and blade. It is in a secure tight fit with the handle. I need your zip code to calculate the postage.